Gerald P. Rodnan, MD (1927-1983), spent most of his career with the Department of Medicine at the University of Pittsburgh School of Medicine. In 1956 he was appointed chief of the newly formed Division of Rheumatology and Clinical Immunology. He rapidly became noted as a teacher and clinical investigator and rose to the rank of professor of medicine in 1967. Dr. Rodnan published extensively and served as editor of several publications dealing with rheumatic disease. He was president of the American Rheumatic Association in 1975-1976 and became a member of the prestigious Association of American Physicians in 1983, the year of his death. 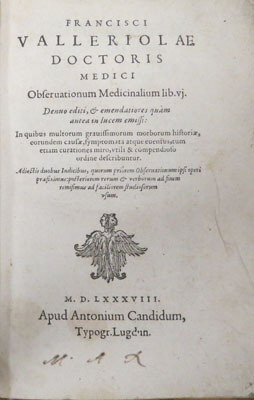 Whether Dr. Rodnan contracted his incurable bibliophilia as a result of his medical interests, or whether these interests merely gave it direction, is uncertain. However, his first research projects dealt with various aspects of gout, a disease that has a particularly rich representation in literature and art. His purchase of a few nineteenth-century books to attain a fuller understanding of the origins of scientific knowledge of gout proved to be the beginning of a quarter of a century of collecting which resulted in an outstanding library that was donated to Falk Library in 1985. The subject of gout—in its ancient humanistic conception, as well as its clinical and biochemical chemistry—forms the largest and most valuable part of the collection. In addition, Dr. Rodnan gradually broadened the scope of his acquisitions to encompass all of the rheumatic diseases. Because of the clinical overlap between certain aspects of rheumatology and dermatology, a more limited selection of historically-important works pertaining to the skin can also be found. This generous gift was made to the Falk Library by the children of Drs. Gerald and Joan Rodnan: Leslie, Andrew, and Meredith. 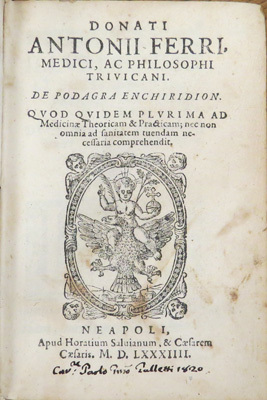 Thomas Sydenham's Tractatus de podagra et hydrope… [Tract on gout and dropsy] (1683) - the original Latin edition, Dr. Rodnan's last purchase, is perhaps the collection's greatest rarity. 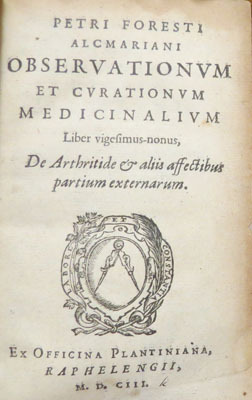 This work, of which the collection contains several English editions, was the first to clearly distinguish gout from other varieties of joint disease. 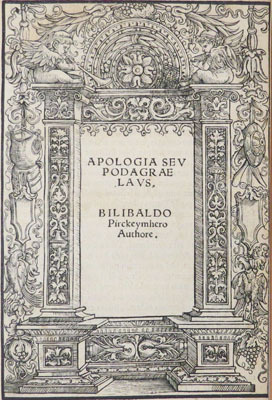 Willibald Pirckheimer's Apologia seu podagrae laus [Apology for gout] (1522) was the first of the medical discourses which sought to advise the laity how to avoid various ailments. 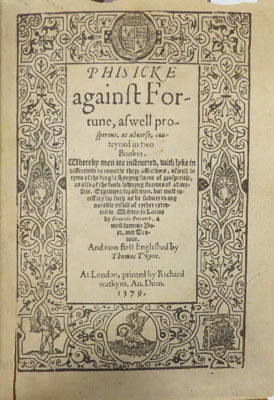 Francesco Petrarca’s Phisicke against fortune… (1579) Thomas Twyne's English translation of Petrarch contains a fatalistic section on gout. The development of contemporary rheumatology may be traced in a complete set of the editions of Arthritis, the standard American textbook, from its first edition by Bernard Comroe in 1940 to its eighth in 1972.